Pre-Order Merch Pt. 2: Posters & Blankets! Your long-awaited 311 Cruise VI posters and blanket are here! 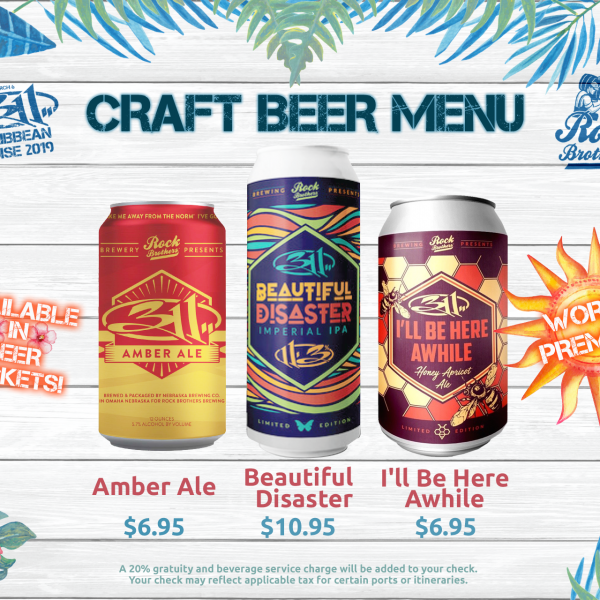 Visit www.The311Store.com and log into your account to view and purchase these items under the Cruise Merchandise tab. Refer to our previous pre-order merchandise email HERE to read up on all the details for purchasing. If you have any issues or questions when logging in please contact The 311 Store by calling (714) 581-5980 or emailing customerservice@The311Store.com. This second Merch Pre-Order will run Friday, January 25 through Friday, February 8 at 3pm PST. The pre-order will be hosted at www.The311Store.com - read below for instructions. The process will be different for those who already have an account with The 311 Store and those who are new to The 311 Store. The pre-order will run Friday, January 25 through Friday, February 8 at 3pm PST. Pre-ordered cruise merchandise will be mailed to you prior to sailing. This merch is exclusive to only those currently booked on the cruise. I have an account at The 311 Store! Step 1: Log in to your account www.the311store.com/account/login. Step 2: Beginning January 25th - once logged in there will be a link for “Cruise Merch” in the top right menu bar. Click it to access the 311 Caribbean Cruise collection. Step 3: Shop around & get your cruise merch in advance! *If the email address you use to access your account at The 311 Store is different than the email address that you are using for your 311 Caribbean Cruise reservation with Sixthman, then follow the instructions below as though you are new to The 311 Store. Only accounts that have email address associated with a 311 Caribbean Cruise reservation will be able to access the private “Cruise Merch” portion of the web store. I Don't Have an Account with The 311 Store. It's all good! You'll follow this process if you don’t have an account with The 311 Store (311’s online merch store) OR if the email address associated with your account at The 311 Store is different than the email address associated with your Sixthman Account / 311 Cruise reservation. Step 1: On December 18th or 19th, you would have received an email from The 311 Store with a link to activate your account and to choose a password. The email will come from customerservice@the311store.com. No need to create your own account, wait for The 311 Store email prompting activation. Step 2: Once you have received that email and activated your new account, you will be able to log into the store at www.the311store.com/account/login. Step 3: Beginning January 25th - once logged in there will be a link for “Cruise Merch” in the top right menu bar. Click it to access the 311 Caribbean Cruise collection. Step 4: Shop around & get your cruise merch in advance! f you need to update your 311 store password or if you forgot your password you can simply visit the same link: www.the311store.com/account/login and click “forgot your password." If you have any issues or questions when logging in please contact The 311 Store by calling (714) 581-5980 or emailing customerservice@The311Store.com.